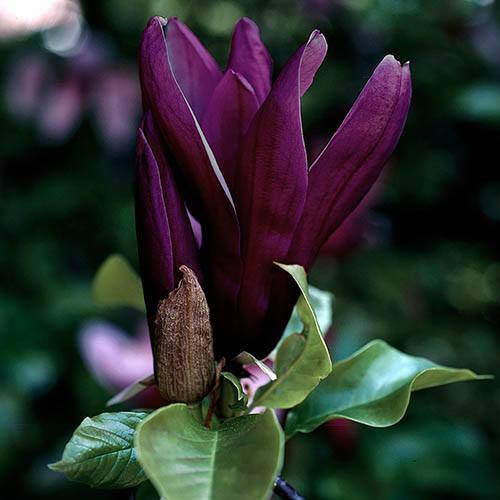 Introducing one of the darkest available Magnolias that you can buy. A premium, unusually dark-flowered magnolia for a border or even a large patio container, Magnolia x brooklynensis 'Black Beauty' is perfect for growing in smaller gardens. A new introduction from the Brooklyn Botanic Gardens breeding program and not widely available, this is one of the darkest magnolias available to the home gardener. Sumptuous dark purple, almost black, tulip-shaped blooms open to reveal a contrasting creamy white interior and a sublime perfume. Easy to grow, this fully winter-hardy Magnolia makes an eye-catching focal point in smaller spaces, and it's super-easy to look after. Reaching just 1.8m (6ft) in 10 years, your Magnolia will be sent as a bare root bush and is ready for immediate planting - a cost-effective way to get your hands on this rare beauty. An unusual, premium magnolia for a border or even a large patio container, Magnolia x brooklynensis 'Black Beauty' is slow growing yet produces many flowers - perfect for growing in small gardens. Blooming from late spring into early summer, Black Beauty avoids many damaging late frosts, so manages to keep its flowers pristine when other magnolias do not. An extremely hardy plant in general, surviving below -30C! Easy to grow, this fully winter-hardy Magnolia makes an eye-catching focal point in smaller spaces, and its super-easy to look after. Reaching just 1.8m (6ft) in 10 years, your Magnolia will be sent as a bare root bush and is ready for immediate planting - a cost-effective way to get your hands on this rare beauty. Please note that your tree is dormant and will not have any leaves until the spring. Supplied as a bare-root bush, ready for immediate planting. This deciduous plant is sent dormant and without leaves.